When I was young, I always acted as if I hated discipline. It was part of the game. Now that I am older, I am so thankful that my parents loved me enough to discipline me strongly, to guide me lovingly, and encourage me repeatedly. This "discipline and training of God" has given me so many blessings. Now if I can just learn to recognize and appreciate the Lord's discipline in my life the same way! The lack of love is not hate, but indifference. The opposite of concern is an unwillingness to discipline. Thank God that he loves us and knows us enough to be involved in our lives and discipline us in the direction of heaven. Father in heaven, please help me to recognize your discipline and correction in my life. I want to live for you with an undivided heart, pleasing you in word, thought, and deed. I confess, however, that sometimes my heart is rebellious or my resolve is weak. 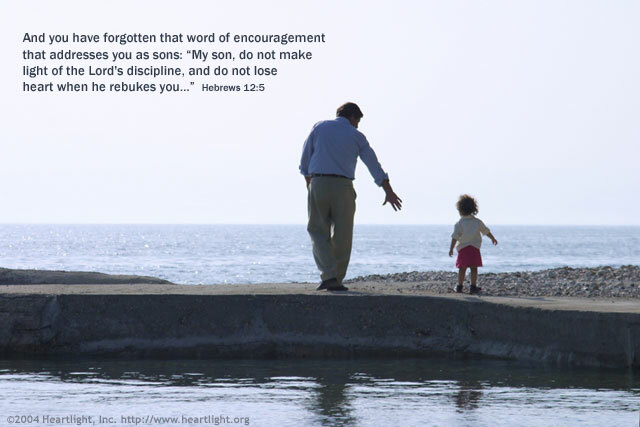 I thank you for helping me recognize my loss of spiritual direction through your loving discipline. In Jesus' name I pray. Amen.